SOUTHINGTON – Children’s Librarian and cosplay enthusiast Molly Virello is Southington Public Library’s Artist of the Month for the month of April. 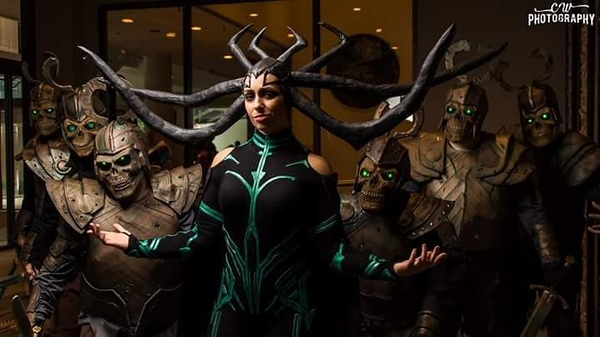 The library, located at 255 Main St., is showcasing a pictorial exhibition titled “Con-Struction: A Goddess is Born”, which details Virello’s costume build of Hela, the villain from the 2017 movie Thor: Ragnarok. Visitors to the library can watch how the costume came to life, from its start as a paper pattern, then to carving foam and building molds, pouring silicone and latex, sewing bodysuits and finally fitting a crown of horns. Through the picture display, the Goddess of Death is born, takes shape and recruits an army. Southington Public Library will be having its own Comic Con this June. Exhibits at the gallery at Southington Public Library are on display during regular hours, Monday through Thursday from 9 a.m. to 9 p.m. and Friday and Saturday from 9 a.m. to 5 p.m. The gallery is located on the main level near the café. To learn more about having an exhibit at the Gallery, contact Elizabeth Chubet at 860-628-0947, EXT. 6513 or email chubete@southington.org. Posted in New Britain Herald, Southington Herald on Thursday, 21 March 2019 18:44. Updated: Thursday, 21 March 2019 18:46.